Burning Abyss I: "Each of us bears his own Hell." 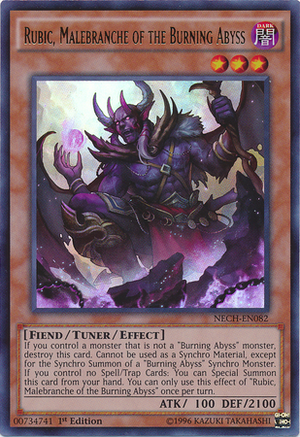 The Burning Abyss, a TCG exclusive theme introduced in Duelist Alliance, features monsters/men straight out of one of the greatest pieces of Western Literature of all time, Dante Alighieri's Inferno: thus far, we have a collection of Malebranches, level 3 dem- fiends with 3 effects, and the protagonist himself, a level 3 warrior Xyz who's hellbent on sending as many demons as he can screaming back to the Underworld (the theme of 3's is meant to mirror the poem's rhyme scheme--but more on that later)! The Malebranch's 3 common effects: they will each explode if not amongst another member of the theme (or perhaps being negated by tour guide of the underworld); they boast the ability to special summon from your hand assuming your backrow is kept clean; and finally, each have a unique effect when sent to the grave. Dante's 14th century epic is far more than just merely "entertaining"; it's both a political allegory (conveniently placing many of his opponents, by name, not just in Hell but within its latter [read: more gruesome] parts) and an allegory for the circularity of life and death: what you do in life will unequivocally be done unto you in death. It's simple, really: if you can't do the time, don't do the crime. "Wel--Welcome..? Yes, welcome to Hell!" "Your sin, please." ...*ahem*..."State your sin, PLEASE." "You bumped your head on the way down, you say?" "No problem; the ins and outs of this place have been well-documented for the last, say, 700 years or so." "...an eternity to read all that, you say?" 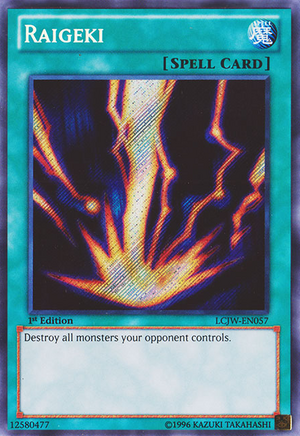 If you control a monster that is not a “Burning Abyss” monster, destroy this card. You can only use 1 of the following effects of “Scarm, Malebranche of the Burning Abyss” per turn, and only once that turn. 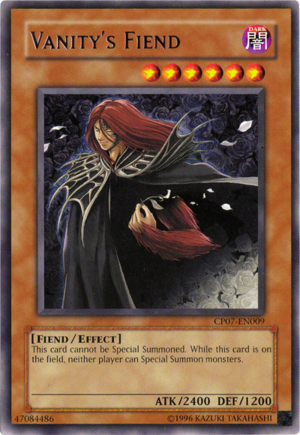 ● During the End Phase, if this card was sent to the Graveyard this turn: You can add 1 Level 3 DARK Fiend-Type monster from your Deck to your hand, except “Scarm, Malebranche of the Burning Abyss”. The theme's first revealed main deck monster has strong potential for overlaying for a one turn rank 3, assuming you don't have any backrow of course. Its search is easily triggered by being sent to the graveyard from anywhere, be it from milling, battle destruction, or detachment. Notice that although it can search other Malebranches, Tour Guide of the Underworld is not out of reach either! "If you control a monster that is not a “Burning Abyss” monster, destroy this card. You can only use 1 of the following effects of “Graff, Malebranche of the Burning Abyss” per turn, and only once that turn. ● If this card is sent to the Graveyard: You can Special Summon 1 "Burning Abyss" monster from your deck, except “Graff, Malebranche of the Burning Abyss”." As only our second monster introduced, Graff is incredible. The ability the theme will have to access extra deck monsters (especially once we receive more) is looking very bright with deck tutoring and searching. Its stats do leave something to be desired, but then again it is a utility card, not a beater. This card will open up incredible searching power once the theme has more than two targets to choose from. "If you control a monster that is not a “Burning Abyss” monster, destroy this card. You can only use 1 of the following effects of “Cir, Malebranche of the Burning Abyss” per turn, and only once that turn. ● If this card is sent to the Graveyard: You can target 1 "Burning Abyss" monster in your graveyard, except “Cir, Malebranche of the Burning Abyss”; special summon it." Cir is Graff, but special summons a Burning Abyss monster from the grave instead. Any Burning Abyss monster. Dante might not be a terribly ideal target, but I'm confident our synchro will love this. In the mean time, it is yet another card in our arsenal that struts fantastic rank 3 potential. "If you control a monster that is not a “Burning Abyss” monster, destroy this card. You can only use 1 of the following effects of “Alich, Malebranche of the Burning Abyss” per turn, and only once that turn. 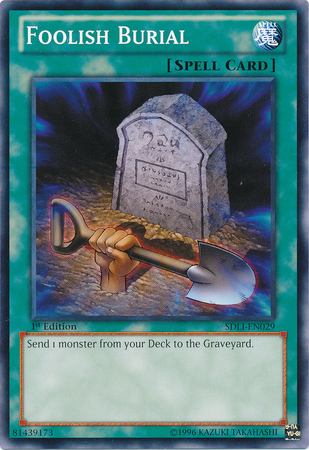 ● If this card is sent to the Graveyard: You can target 1 faceup monster on the field; negate its effects." 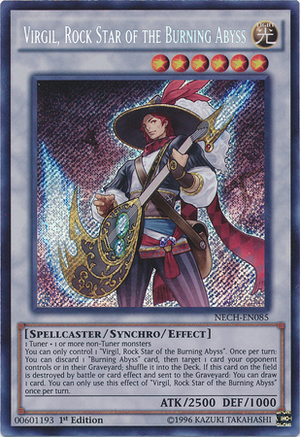 Alich is essentially a searchable, recursive [YGOCARD]Breakthrough Skill[/YGOCARD]. Negating monsters repeatedly by readding it with Dante or respecialling it with Cir, or even something as simple as sending it to the graveyard with [YGOCARD]Foolish Burial[/YGOCARD] is a potent way of halting continuous effects that this deck struggles against like [YGOCARD]Vanity's Fiend[/YGOCARD]. It's of particular note that Alich has 0 defense, making it compatible with [YGOCARD]Masked Chameleon[/YGOCARD] and [YGOCARD]Recurring Nightmare[/YGOCARD]. "If you control a monster that is not a “Burning Abyss” monster, destroy this card. You can only use 1 of the following effects of “Calcab, Malebranche of the Burning Abyss” per turn, and only once that turn. ● If this card is sent to the Graveyard: You can target 1 set Spell/Trap on the field; return that target to the hand." Calcab doesn't generate card advantage like his predecessors did. 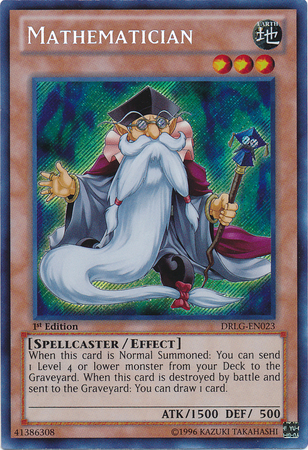 Thankfully returning set Spell/Trap cards has merit outside of gimmicky strategies like [YGOCARD]Treasure Map[/YGOCARD]. 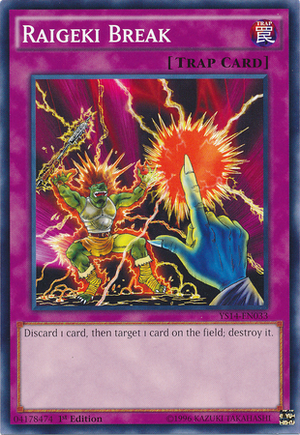 Discarding it for [YGOCARD]Raigeki Break[/YGOCARD] will remove 2 backrows from the field to prepare for a big push, and sending it for a failed Fire Lake can help start a counterattack. Of particular note is Calcab's defense of 0, making it compatible with [YGOCARD]Masked Chameleon[/YGOCARD] and [YGOCARD]Recurring Nightmare[/YGOCARD]. RULING: If the set card is chained, it will not be returned to the hand. "If you control a monster that is not a “Burning Abyss” monster, destroy this card. Cannot be used as a [YGOCARD]Synchro Material[/YGOCARD] monster, except a "Burning Abyss" monster. If you control no Spell/Trap Cards: You can Special Summon this card from your hand. You can only activate the effect of "Rubic, Malebranche of the Burning Abyss" once per turn." Our tuner for Virgil. It seems much less fancy than his fake leak assumed, but it still has strong points. Since it lacks a graveyard effect, Rubic will most likely end up special'ing itself to the field with its effect, allowing you to capitalize on another Burning Abyss monster's effect. Rubic's defense is 100 points higher than Scarm's, giving it the ability to wall Artifact Moraltach and other monsters of the 2100 attack range. 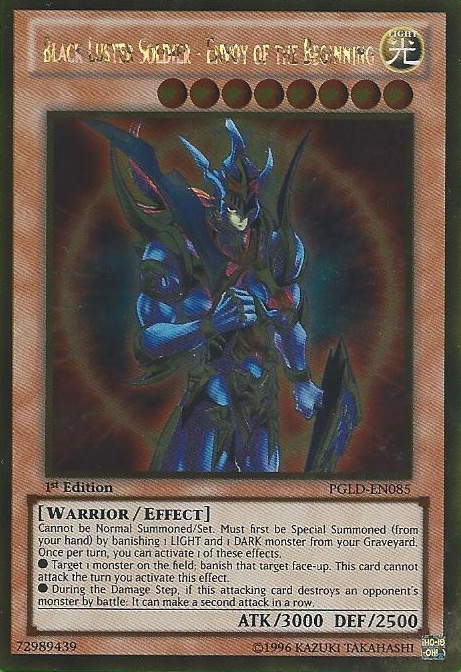 Be wary as being a Tuner that can special summon itself, it will attract Maxx "C"s.
Target any number of "Burning Abyss" monsters in your graveyard that were sent there this turn; Special Summon them in Defense Position. You can only activate 1 "The Traveler and the Burning Abyss" per turn. The potential to generate an entire field field of monsters (without having to pay life points) is terrifying. Having to have had those monsters already put in the grave this turn? A little less so. At the end of the day, it's an easy way to rank 3 and gives your Malebranche the ability to trigger their abilities again. "Send 2 "Burning Abyss" monsters you control to the graveyard and target up to 3 cards your opponent controls; destroy those targets." In the Divine Comedy, the Fire Lake was used to punish Dante's political enemies. In games, Fire Lake will let you punish your opponent for having too many cards out at once. Similar in function to [YGOCARD]Icarus Attack[/YGOCARD] of Blackwing fame, this will trade some monsters you control for cards from your opponent....but we can't really consider it a trade if we get to keep the effects of the sent monsters, can we? Even if your opponent negates it, it will never lose you card advantage and can be recycled with Dante if the need arises. Remember it is best used reactively. Once per turn: You can detach 1 Xyz Material from this card and choose a number from 1 to 3, then, send that many cards from the top of your Deck to the Graveyard; until the end of this turn, this card gains 500 ATK for each card sent to the Graveyard this way. If this card attacks, it is changed to Defense Position at the end of the Battle Phase. If this card is sent to the Graveyard: You can target 1 “Burning Abyss” card in your Graveyard, except this card; add it to your hand. Dante... Is generic? We'll roll with it. At first glance the card strikes as a buffed [YGOCARD]Card Trooper[/YGOCARD], which seems fairly accurate. Reaching 2500 attack in the battle phase is an impressive feat for a rank 3. His excellent defense (also boasted by Scarm) helps to protect him in the opponents turn. His milling effect is obviously intended to help trigger your fiend's third effect. If your 2500 defense fails however, not all is lost! You can add any Burning Abyss card back to your hand, which might prove important depending on how much spell and trap support the theme receives. "You can only control 1 "Virgil, Rockstar of the Burning Abyss." Once per turn, you can discard a "Burning Abyss" card and target one card your opponent controls or in your opponent's graveyard; shuffle that target into the deck. If this card is destroyed: You can draw 1 card." Ahh Virgil. Rockstar isn't quite what he was in the Divine Comedy, but he certainly looks badass enough. Those of who you know of [YGOCARD]Madolche Queen Tiaramisu[/YGOCARD] will understand the raw power behind return to deck effects, bypassing all known floation abliities (save for the obscure Reptile Princess). 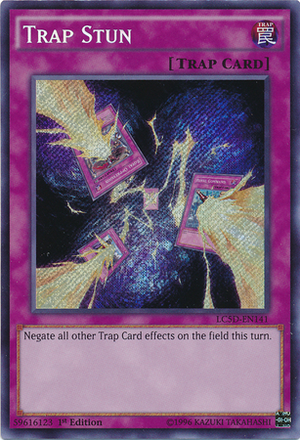 Even though you will most likely be discarding a Malebranche to use Virgil's effect, you can also discard one of the themed traps instead, adding versatility. The most important thing about Virgil, though, is his 2500 attack, putting him far ahead of the rest of the archtype and giving the deck a much needed boost in raw muscle. When this card is Normal Summoned: You can Special Summon 1 Level 3 Fiend-Type monster from your hand or Deck. Its effects are negated, and it cannot be used as a [YGOCARD]Synchro Material[/YGOCARD] Monster. One of the most prevalent staples in the game, TGU seems to have been around in the meta forever. But its usefulness in Hell is even greater! A one card Dante is great, along with any other Rank 3 (or even Virgil!) you might like. Note that it does save your Malebranches from self-destruction! When this card is Normal Summoned: You can send 1 Level 4 or lower monster from your Deck to the Graveyard. When this card is destroyed by battle and sent to the Graveyard: You can draw 1 card. Another starting key for the engine. 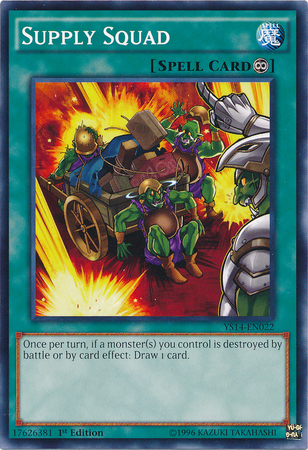 The draw on destruction works very nicely with [YGOCARD]Creature Swap[/YGOCARD] and [YGOCARD]Supply Squad[/YGOCARD]. Assured plusses in both effects gives this card the edge over [YGOCARD]Kuribandit[/YGOCARD]. "Cannot be Special Summoned. Neither player can Special Summon monsters." Continuing with the general trend of 1-tribute monsters is [YGOCARD]Vanity's Fiend[/YGOCARD]. A longtime staple of Frognarch sides, this card is proving more and more powerful in the heavy Special Summon format we're in. Summoning it early can end games prematurely in your favor. "Cannot be Special Summoned. Monster effects cannot be activated." Vanity's counterpart. Majesty's ability is farther reaching than you might expect; not only does it block stuff that isn't on the field like handtraps and graveyard effects, it also prevents their activation instead of outright negating them, which is a stronger form of floodgating. 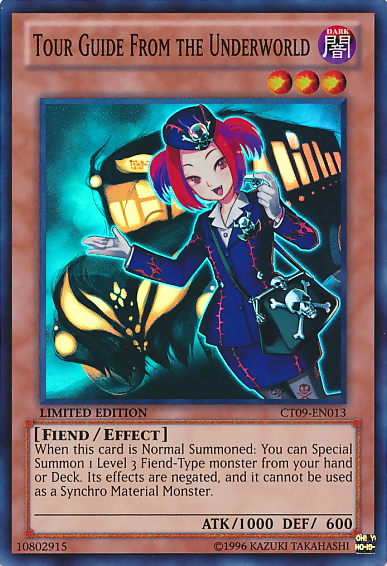 While it's not as effective as [YGOCARD]Vanity's Fiend[/YGOCARD] in this metagame, it's worth keeping in mind for future metas, or just in your side for those monster-effect heavy matchups. 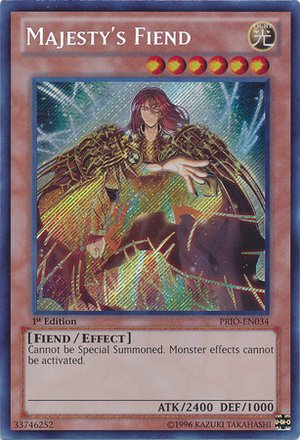 RULING: [YGOCARD]Majesty's Fiend[/YGOCARD] cannot negate continuous effects (such as the Burning Abyss self-destruct clause), as these never activate. Cannot be Normal Summoned/Set. Must first be Special Summoned (from your hand) by banishing 1 LIGHT and 1 DARK monster from your Graveyard. Once per turn, you can activate 1 of these effects. ● Target 1 monster on the field; banish that target face-up. This card cannot attack the turn you activate this effect. ● During the Damage Step, if this attacking card destroys an opponent's monster by battle: It can make a second attack in a row. Black Luster Soldier has a easy time coming out in this theme due to our protagonist's LIGHT attribute. A boss of this power that can be prepared in just one rank 3 is hard to pass up. The 3000 attack stat is great to help close out games. Draw 2 cards, then banish 1 DARK monster from your hand, or, if you don't have any in your hand, send all cards in your hand to the Graveyard. Banishing might not be ideal, but trading potentially dead-in hand Malebranche late game for traps might be what you need. Especially with access to Leviair! Trigger your Malebranches! I bet they'd prefer the graveyard anyway. [YGOCARD]Foolish Burial[/YGOCARD] is hands down one of the most powerful cards in the deck with all of the effects it can potentially trigger without requiring a normal summon. "Destroy all monsters your opponent controls." Well, the TCG banlist let Thunderbolt out? Intriguing! There's not much to say about Raigeki, it kills monsters without cost setup or restriction. While it probably won't allow you to gain card advantage, the damage opening/tempo it can bestow you can be just the thing you need to close games out fast. It's also a nontargeting card, allowing us to beat non-targetable menaces like Leo, Keeper of the Sacred Tree that we cannot beat with our discard traps. 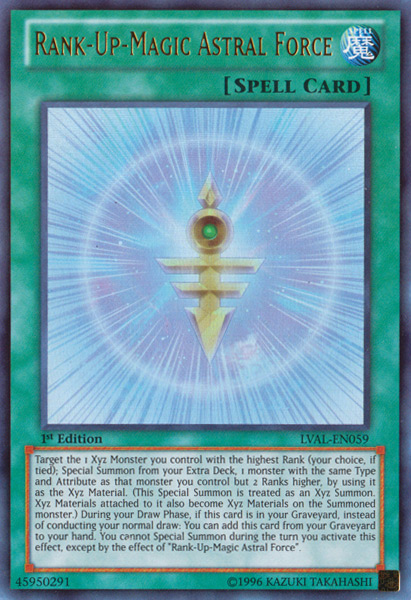 Target the 1 Xyz Monster you control with the highest Rank (your choice, if tied); Special Summon from your Extra Deck, 1 monster with the same Type and Attribute as that monster you control but 2 Ranks higher, by using it as the Xyz Material. (This Special Summon is treated as an Xyz Summon. Xyz Materials attached to it also become Xyz Materials on the Summoned monster.) During your Draw Phase, if this card is in your Graveyard, instead of conducting your normal draw: You can add this card from your Graveyard to your hand. You cannot Special Summon during the turn you activate this effect, except by the effect of "Rank-Up-Magic Astral Force". Astral force attempts to solve the deck's weakness of being limited to rank 3s as their most powerful in-house plays. The ability to summon rank 5s allows for much more powerful bosses giving a win condition to the deck's advantage driven game. The extra deck is not very tight, so fitting in lots of different paths for this card isn't very hard. Once per turn, if a monster(s) you control is destroyed by battle or by card effect: Draw 1 card. Discard 1 card, then target 1 card your opponent controls; place that target on the top of the Deck. Trigger a Malebranche, spin a card. It's fairly basic, and it's fairly good. This card should probably find a place amongst your staple traps as the deck has a reasonable amount of room for them in the first place. "Discard 1 card to target 1 card on the field; destroy that target." "Discard 1 card and target 1 faceup monster your opponent controls; banish that target faceup, then banish all monsters with the same name as the targeted monster from your opponent's graveyard." Another discard trap, this one specialized in grave purging. A very good effect to have on hand vs those silly people who refuse to admit Satellaknights are dead. Like Wing Blast, it will remove floaters without triggering them, so it's a lot better than other traps that would do so. "Negate the effects of all faceup Trap Cards on the field until the end of this turn." Trap Stun has been a deceptively good card for ages. It's got our attention because it is one of the only non-combo ways of dealing with enemy traps. Of particular note is Emptiness, whose Special Summoning block AND self-destruct effect are negated by [YGOCARD]Trap Stun[/YGOCARD], allowing you to negate your opponent's and lock them behind it, or turn off your own for a big combo turn. become more and more useful. so one might choose to use them in stead. Special Summon that target. Its effects are negated. You can only use the effect of "Crane Crane"
(re: negates their xenophobia). Dante being generic will no doubt be essential for its usability. its effect its popularity could likely increase. of our demons. Only our deck is allowed to depend on the underw- graveyard! [color="Silver"]Burning Abyss monsters don't enjoy the company of off theme monsters. best use of opponents monsters ourselves. keep field presence and provides aid to the lacking destruction the theme currently has. hilarious interaction with Wing Blast, setting your opponent back 2 draw phases. As the mirror becomes more prevalant this has fallen off the map more and more. in the past few weeks, making him a more noteworthy maindeck and sidedeck choice. 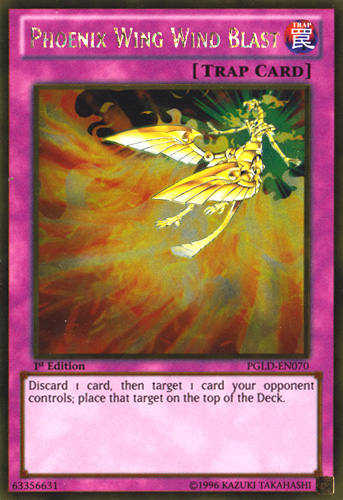 turn ([YGOCARD]Escalation of the Monarchs[/YGOCARD], [YGOCARD]Ultimate Offering[/YGOCARD], etc). [I]"Activate if you have 7 or more DARK monsters in your graveyard. no play because of its steep activation requirement and somewhat painful cost. quickly and do so without in-yard utility, making this a more optimal choice for playing. brought on by a need to fuse the consistency of Burning Abyss with the raw power of Shaddoll. Beginning of the End in the current game. + some synchros (5,6,7,10) and R3/R4s. Thanks for reading the guide, and we hope that you are now as passionate about The Burning Abyss as we are. Build the deck, test the deck, compete with the deck, and post results, suggestions, and even builds below! Props to Urnighter for the first 4 threads and a lot of work on the OP, Doom Chef for the past few threads and theory-oh, and Pumpknight for the lore section. Re: Burning Abyss I: "Each of us bears his own Hell." Your quote tags are messed up. I'll see if I can fix them. Eh, I don't think the quote tags work. I've replaced them by signing the quote. YGOcard tags from Pojo are bothering me. Good thing we don't have them here.